The Ad Template Report script helps you find the best-performing ad headlines and description lines in your Google Ads account. It aggregates the data for the same headlines and description lines throughout the account. This helps you understand what is working for the account and what is not, and generates a report based on that information. To find the best-performing ad text elements in your Google Ads account. To find the best headline, description or display URL for new ad texts. To get enough data to make statistically valid decisions about ad text performance by aggregating data from similar ads across an entire account. Choose the account you want to run the script in, and go to the All Enhanced Scripts page. On this page select the Ad Template Report script. Enter the name you want to give the setting. You can have multiple settings for the same script, and you can choose to pause and enable these settings as you wish. 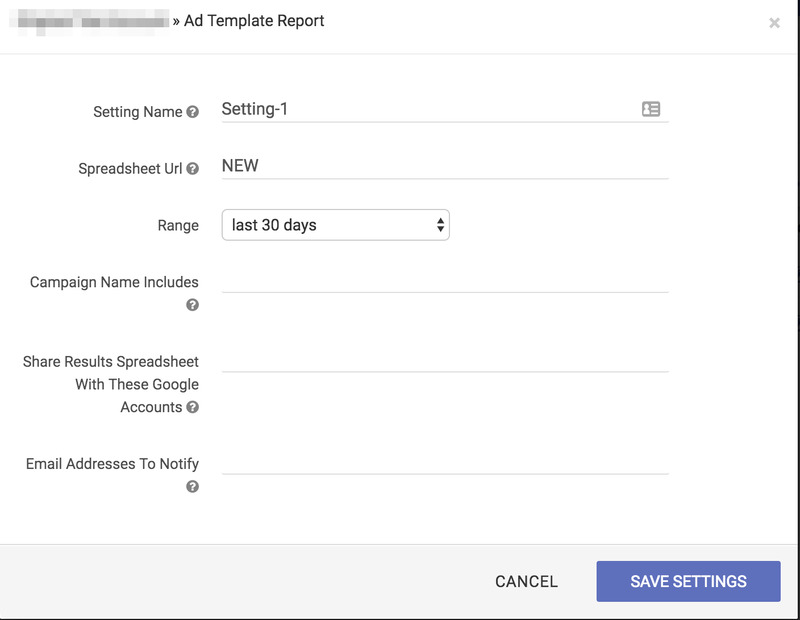 For example, in one setting you can choose to run the ad template report for brand campaigns, and in another setting, you can choose to run it for non-brand campaigns. You can also categorize campaigns based on the products in the campaigns. The script pastes the results in a Google Spreadsheet. If you want to paste the results in an existing spreadsheet, put in the address of the spreadsheet. The sharing settings for the spreadsheet should either be 'anyone with a link' or, it should be shared with the Google Ads email address of the account the script is going to run in. If the sharing settings are not correct, the script will not be able to write the URLs it checks to the spreadsheet. Important: If you select to paste the results in an existing spreadsheet, and this spreadsheet works with multiple tabs, you'll need to make sure that the first tab is not hidden, otherwise the results will not properly display. If you do not wish to override any information or tabs, you can use "NEW" in the settings to paste the results on a new spreadsheet. It will be created in the Google Drive folder associated with your Google Ads account email, and a new spreadsheet will be created each time the script runs. If you don't want to create a new spreadsheet for each time the script runs, you'll need to unhide the first tab. You can do so in the menu bar, under View - Hidden Sheet. Choose the date range for which you want the script to aggregate data. The default is set to last 30 days. If you want to run the script in specific campaigns, you can write the name of the campaign in this field. Leaving it blank will run the script for all campaigns. This can be helpful if you have a very large account or well-segregated campaigns based on product category. For example, if you put 'Brand' in this field, the script will run for all campaigns that have 'Brand' in their name. Enter additional email addresses you want to share the spreadsheet with. By default, the spreadsheet is shared with Google Ads email address. If you would like to send the notification email to another team member, you can enter their emails in the 'Email Addresses To Notify' setting and they will be notified. You can enter multiple email addresses. How to install and run the enhanced script? After entering the details for the setting, click on 'Save settings'. This will give you an option to 'Download' the script which can then be installed in the Google Ads account. For detailed steps on how to install a script in Google Ads, read this article. This script can also be run at the MCC level. This article explains how to install and run enhanced scripts at the MCC level. Google Ads has a 30-minute limit on scripts. If the account is very large, the script may time out without getting data for the whole account. A workaround to this is to use the 'Campaign Includes' setting to create multiple settings for the same account. This way, each setting will run for specific campaigns only.